Recalling the iconic theme that Jordan Brand debuted in the 2000s is the Air Jordan 7 Pure Money release. Perfect for the summer, this release comes dressed in a White, Metallic Silver and Pure Platinum color scheme. Michael Jordan’s classic silhouette from 1992, the Air Jordan 7 features a White leather upper with Pure Platinum underlays and Metallic Silver branding. Look for the Air Jordan 7 “Pure Money” to release on June 3rd at select Jordan Brand retailers and Nike.com. The retail price tag is set at $190 USD. 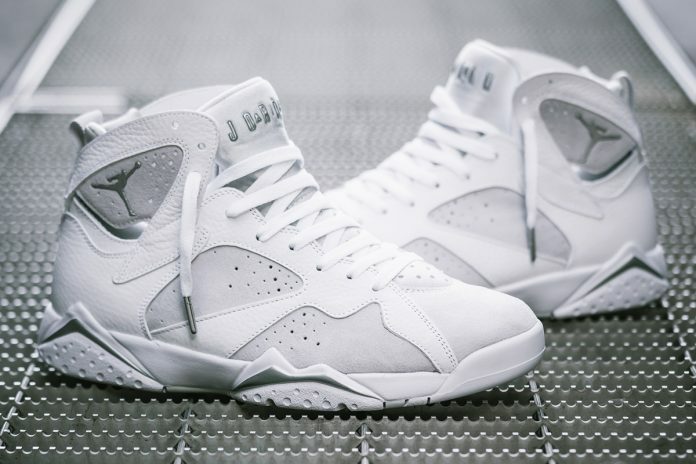 UPDATE: Jordan Brand is set to release the “Pure Money” Air Jordan 7 this Saturday. Check out a few new images via Solebox. UPDATE: Detailed look at the “Pure Money” Air Jordan 7 via GC911.